Carlton looking to go all the way this season again. 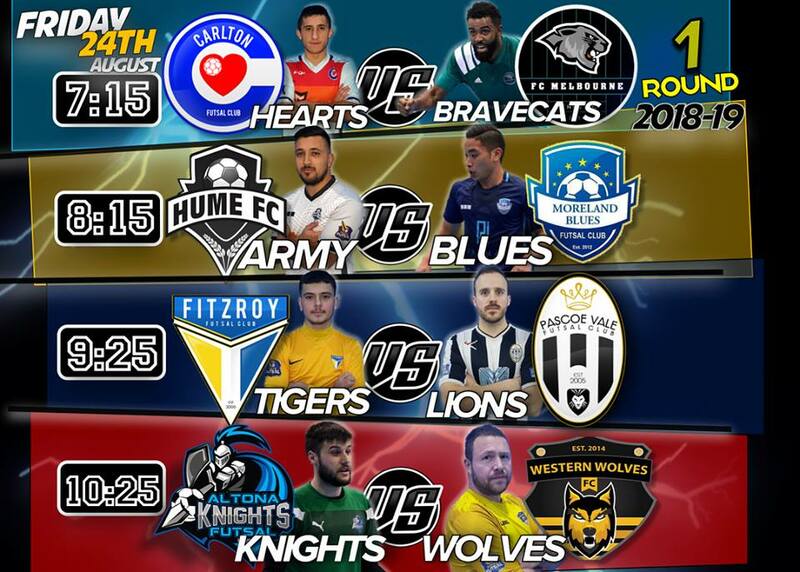 FC Melbourne new comers to Series Futsal Victoria, their first match taking on the reign champs. Carlton looked in find touch early in the game. In the first half Carlton were able to get the first two goals of the games to put the pressure on the new comers. Melbourne keeper felt the pressure early on as Carlton continued to have shots on goal from anywhere. Melbourne’s counter attack was good late in the first half they just struggled to get some reward for effort. Carlton continued to put the pressure on melbourne’s defensive structure and on the scoreboard. Finding themselves 4-nil up with 10 minutes still to play in the first half. Melbourne able to get their first goal on the scoreboard with seven minutes to go in the first half. Carlton with the quick reply score their fifth 20 seconds later. With 40 seconds to go in the first half Carlton able to get their sixth goal for the game. Making it harder and harder for Melbourne to come back from. Second half starts and Carlton get a quick goal to push their lead out. Melbourne respond with their second goal for the game. Not giving up Melbourne continue to press forward hard and put the pressure on Carlton defence. Both keepers working hard to block shots as the game gets more intense as the clock winds down. Melbourne able to score another two goals, but could beat the reign champs in the first round. Carlton too strong wining 8-4. Very Intense first half between Hume and Moreland. Moreland able to get the first goal for the game to give them an early lead. The one goal wasn’t enough breathing space with Hume continuing to press forward hard with so many shots on goal. But Moreland keeper was kept on his toes and was in good form early in the game with some incredible blocks. Hume needed to lift and find that equalising goal, to put the pressure on Moreland not just up forward but even on the scoreboard. Hume having shots on goal, just struggling to get reward for effort. Late in the first half Hume able to get the equalising goal they were looking for. 1-1 at half time. Second half both clubs looking to improve in the second half. Try put some scoreboard pressure on and try crack the defensive back two. The crowd really getting behind both clubs, riding every shot on goal and every turnover. Moreland able to find two easy goals to give them a two goal lead with seven minutes remaining in the game. Hume able to get one back late in the first before Moreland again go on to score. With the lead still at 3 goals Hume not giving up and continuing to find space on the counter attack. Moreland get their first win for the season against Hume. A quick start from Fitzroy seeing them score three minutes in. Giving them an early lead and putting more pressure on Pascoe Vale. With both coaches and and players getting vocal with one another and with referee’s. Pascoe Vale able to find the equalising goal late in the first half. Brining the game to the holt. Both teams making silly turnovers but continue to press forward and have shots on goal. Mauricio Novak made his return to Series Futsal for Pascoe Vale and the crowd certainly got behind him every time he got the ball. At half time 1 all. Both teams looking to find a quick goal to give them the upper hand. Pressure continues to build on both teams and coaches sprays get louder by the minute. Fitzroy went on to score their second goal four minutes into the second half. Two minutes later Pascoe Vale able to find the equaliser for the second time. Game at 2 all and neither team can seem to get an advantage. A few controversial free kicks and shots on goal given to both sides. With 12 minutes to go Fitzroy able to find the top goal and get their third. But 20 seconds later Pascoe Vale awarded a free kick and they convert. Levelling out the game for the third time. The game going back and forth. Pascoe vale for the first time in the game take the lead with under ten minutes remaining in the game. Being on the back foot for most of the game they now put the pressure on Fitzroy. With two minutes remaining Fitzroy find their fourth goal and are able to level out the game for the fourth time. What a game this was it went to penalties. Fitzroy winning in penalties. Last game for the first round. Altona are the new comers coming into this season Series Futsal Victoria. Both teams looking to get the first win under their belts. Western wolves seem to have the momentum early but struggle to find the back of the net. Altona on the other hand struggle to make it past half way and when they get a counter attack going they too couldn’t find the back of the net. Both keepers were kept busy early and saved some great shots. Altona get the first goal for the match with four minutes remaining. Western Wolves looking to find a goal to level out the game just before half time and they do. With five seconds on the clock before half time, Altona score their second goal. Slips through the Western Wolves keeper and giving Altona the lead at half time. Second half under way and Altona get the first goal for the second half. But their two goal lead was short lived with the wolves finding the back of the net two minutes later. Altona look to extend their lead as they score their fourth goal with still 16 minutes left in the game. With the crowd behind them the Western Wolves able to pen one back, finding the bottom corner going into the back of the net to reduce the lead. Both coaches asking their players to lift and keep on pushing hard. Altona continue to put more pressure on the western wolves as they score their fifth with 12 minutes remaining. The game intensifies with minutes remaining. Both teams going on to score late in the game. But with 2 minutes remaining Altona found themselves one goal up 6-5.